You keep laying hens to provide eggs for your family, and possibly to share this bounty with friends and neighbors. If you go out to collect the eggs and find many broken, you could have egg eaters in your flock. While you can stop the casual egg eater, it's not easy to break the confirmed egg eater of this bad habit. Sometimes, it starts quite innocently. You drop an egg during the collection process. Broken eggs can give hens a taste for egg eating, creating little feathered monsters. Egg eating becomes contagious -- hens watch each other and pick up the habit. Egg eating also can start if hens don't receive adequate amounts of calcium and protein, leading to soft-shelled, easily broken eggs. 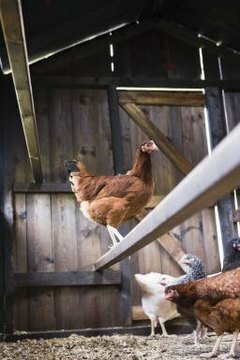 Feed your girls a high-quality chicken feed designed specifically for laying hens. Although it's likely that hens are responsible for egg destruction, it's possible they aren't the guilty parties. Other predators engage in egg eating -- although many of them also will consume the hen. Even if your hen house is pretty predator-proof, small snakes can often gain entry. They are the most likely species, along with rats and other small rodents, to eat eggs but not harm the chickens. If hens are guilty, you'll usually see dried yolk on their heads. Take some time to observe your flock when eggs are in the nest. If you see a hen checking out eggs and pecking them, she's probably an egg eater. If the hens doing the egg breaking and eating aren't laying anymore, it's time to cull them. If they're pets and you can't bear the thought of doing them in or selling them to a slaughterhouse, provide a separate coop and run for them. That way, they can live quite contentedly, but without exposure to eggs and the temptation to break them. If you have a hen that's still producing eggs but is a confirmed egg eater, she'll also have to be culled or exiled to the bad hen house. If you do keep such hens, figure that their eggs are basically sacrificed. To stem egg breaking and eating, try to collect eggs more than once a day. A morning and evening collection helps reduce the number of destroyed eggs. Make sure your nest to hen ratio is at least 4 to 1, with each nest well-bedded with hay or straw. Your chickens should always have plenty of fresh, clean drinking water available. Lack of water or dirty water might cause hens to look elsewhere to slake their thirst, including the interior of eggs. Keep feed available at all times when your hens are indoors, so they don't grow hungry and look for alternative food sources. You can try reforming a conformed egg pecker by removing the genuine eggs and replacing them with fake eggs or a golf ball. Several days of being unable to break eggs might cure some hens of the habit. Can a Hen Lay an Egg Without a Male Rooster? Can Chickens Lay Eggs Without a Nesting Box? What Is the Difference Between Peafowl Egg and Duck Egg Sizes? What Is the Difference Between Chicken Laying Feed & Chicken Scratch? Can White Leghorn Chickens Get Broody?